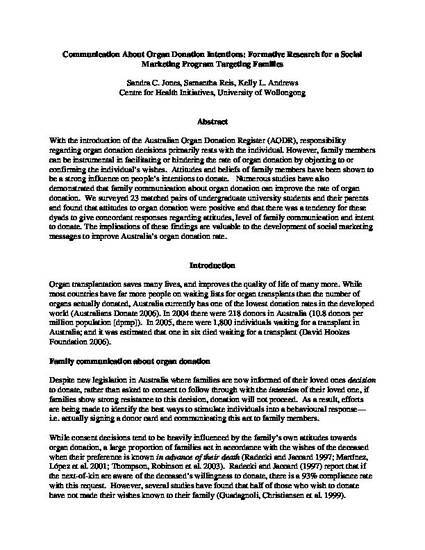 This conference paper was originally published as Jones, S. C., Reis, S. and Andrews, K., Communication About Organ Donation Intentions: Formative Research for a Social Marketing Program Targeting Families, Partnerships, Proof and Practice - International Nonprofit and Social Marketing Conference 2008, University of Wollongong, 15-16 July 2008. With the introduction of the Australian Organ Donation Register (AODR), responsibility regarding organ donation decisions primarily rests with the individual. However, family members can be instrumental in facilitating or hindering the rate of organ donation by objecting to or confirming the individual’s wishes. Attitudes and beliefs of family members have been shown to be a strong influence on people’s intentions to donate. Numerous studies have also demonstrated that family communication about organ donation can improve the rate of organ donation. We surveyed 23 matched pairs of undergraduate university students and their parents and found that attitudes to organ donation were positive and that there was a tendency for these dyads to give concordant responses regarding attitudes, level of family communication and intent to donate. The implications of these findings are valuable to the development of social marketing messages to improve Australia’s organ donation rate.